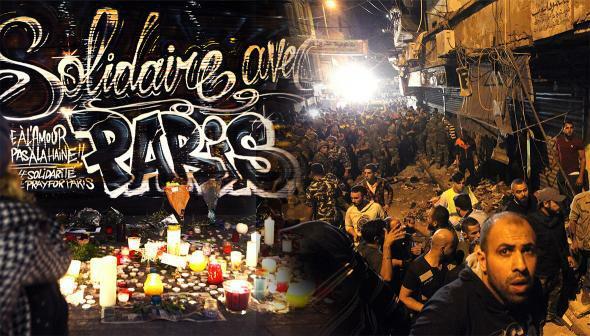 The media covered the Paris attacks more than the Beirut bombing. The problem gets worse from there. Does Paris Matter More Than Beirut? You’d think so from the media’s coverage. And the problem goes a lot deeper than the level of attention. A woman sits in front of candles and flowers at a makeshift memorial on Nov. 16, 2015 in Nice, in tribute to Nov. 13 attacks in Paris. Emergency personnel gather at the site of a twin suicide bombing in Burj al-Barajneh, in the southern suburbs of the capital Beirut on Nov. 12, 2015. On the morning of Saturday, Nov. 14, readers of the national print version of the New York Times were greeted with a memorable and horrific front page. “PARIS TERROR ATTACKS KILL OVER 100; FRANCE DECLARES STATE OF EMERGENCY,” read the double-decker banner headline, the sort of emphasis reserved for only the biggest stories. Approximately three-fourths of the front was given over to coverage of the Paris attacks, with three large photographs and three separate stories on the topic. The Paris attacks received similar emphasis in the Sunday and Monday Times, and understandably so. “Terrorists attack a world capital” is, by any standard, front-page news. The front page of the Times on Friday, Nov. 13 also featured news of terrorist attacks in a world capital. But the ISIS–linked bombings in Beirut, Lebanon, which killed at least 43 people and wounded hundreds more, weren’t as prominently featured as the Paris attacks would be the next day. “Dozens Killed in Beirut Attack,” read the below-the-fold reefer in the bottom-left corner of the page, alongside a blurb directing readers to turn to page A6 for more on the story. By Saturday morning, the Beirut bombings had dropped off the front page entirely. The Beirut attacks returned to the Times front page on Sunday, but indirectly, as part of a below-the-fold story titled “Strategy Shift for ISIS: Inflicting Terror in Distant Lands”—and the headline seemed fitting. As far as the mainstream media seems to be concerned, there is the West, and then there are distant lands, and breaking news in the former inevitably trumps the same in the latter. This inherent “home team” bias has been particularly evident in the Western media’s disparate treatment of the Beirut and Paris attacks. The latter story has dominated print, broadcast, and online news outlets for the past three days; the former has been comparatively abandoned. At times over the past few days, it’s seemed like the only people talking about Beirut are critics wondering why Westerners don’t care as much about Beirut as they do about Paris. We shouldn’t forget that the Paris attacks were bigger, deadlier, and more sophisticated than the Beirut attacks; they also happened in a location that’s more immediately accessible for English-language journalists. Put it all together, along with the Western media’s inherent Western bias, and of course the Paris attacks would dominate the front page. For better or for worse, Western news media will always prioritize news that immediately affects the West, and that’s understandable. But there’s a substantive difference between downplaying news of crisis in distant lands and failing to report that news with the same sort of empathy and humanity it deploys when crisis strikes closer to home. And that’s been the real problem in the media’s coverage of the two attacks—and perhaps an explanation of why such coverage disparities persist. The Times wasn’t the only newspaper to give the Paris attacks more prominent placement than the Beirut attacks. On Friday, Nov. 13, for example, the front page of the U.K. print edition of the Guardian and that of the U.S. edition of the Wall Street Journal made no mention of the Beirut bombings; on Saturday, the Paris attacks drew banner headlines in both the Guardian—“Horror returns to heart of Paris”—and the WSJ—“MASSACRE IN PARIS”. The front page of the print Washington Post referred to the Beirut bombings below the fold on Friday, pointing readers toward a story on page A11. On Saturday, the Paris attacks received a banner headline reading, “Assault on Paris: More than 140 killed,” and the Beirut bombings had dropped off the front page. November, cool but pleasant. People filled outdoor cafes, sipping espresso or wine. Restaurants were jammed, bars were noisy and fun. More than 80,000 people, including President François Hollande, jammed into the Stade de France just north of the city, most of them cheering for France to thump Germany in a soccer match. Then, in the period of about a half-hour, Paris changed. Well, Beirut changed, too, one would think. Could one reason why Westerners don’t care about Beirut—one reason we don’t demand our media cover it more—be that much of the reporting on it doesn’t make us empathize with the humans there? Of course there are structural impediments that make it easier for reporters to report in Paris than in Beirut. All the same, you didn’t see any news reports from Paris leading with the observation that “the attacks are a message to the government of François Hollande, which has participated in airstrikes against ISIS in Syria.” And you likely didn’t read any first-day Beirut stories that led off with poignant anecdotes about soccer games and people out to dinner. People spend time in cafes in Beirut, too—and if a city’s leisure habits are worth reporting when disaster strikes Europe, they are worth reporting in other locales, too. The New York Times acknowledged as much on Monday, when it published an excellent story by correspondent Anne Barnard titled “Beirut, Also the Site of Deadly Attacks, Feels Forgotten.” The story ran on page A6.